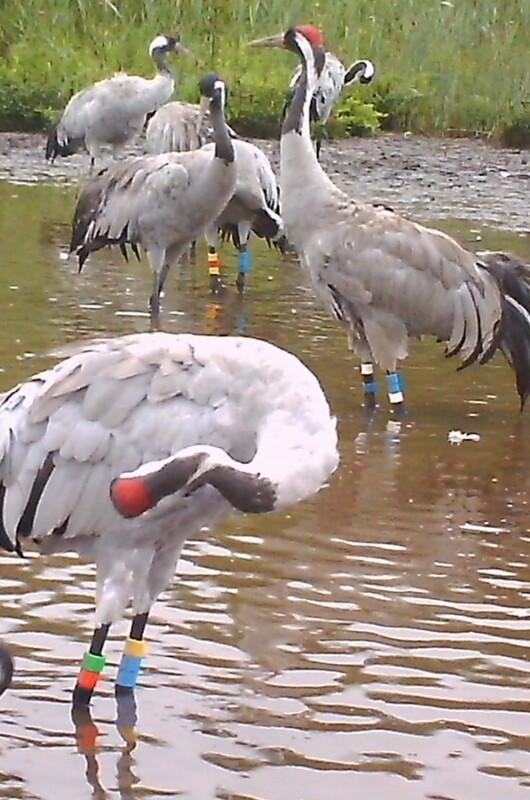 The project is managed by the nonprofit organization Crane Conservation Germany. 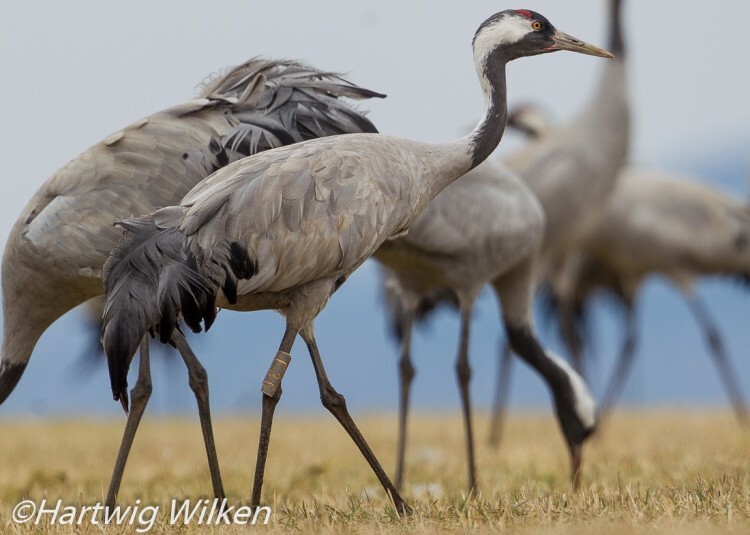 Crane Conservation Germany is executed by the Nature and Biodiversity conservation Union (NABU) and will be supported financially by Lufthansa Group. At the moment, ringing projects from seven European countries work with iCORA. 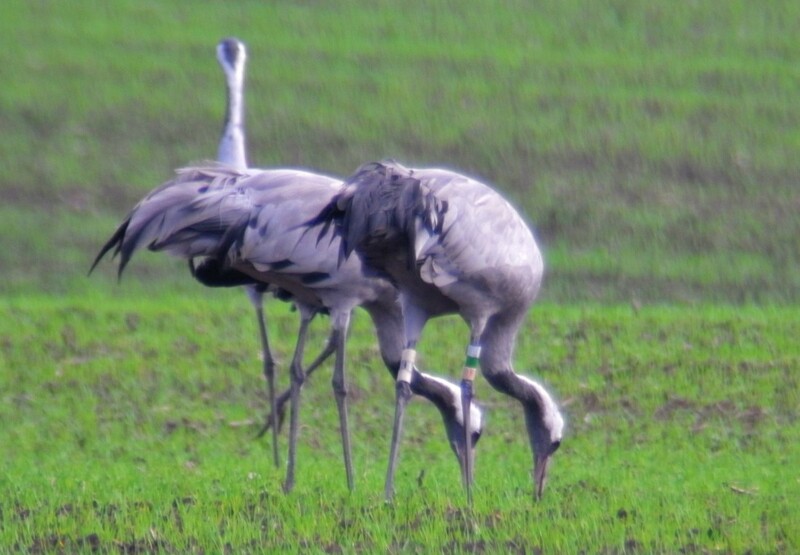 The database currently contains data about more than 3,800 cranes ringed in Europe and more than 140,000 recoveries of these birds. Reports from cranes, where projects not use iCORA so far, are regularly forwarded to the relevant project leaders and ringing centers. On a long-term perspective we are working to develop iCORA as the main platform for all crane ringing projects in Europe. 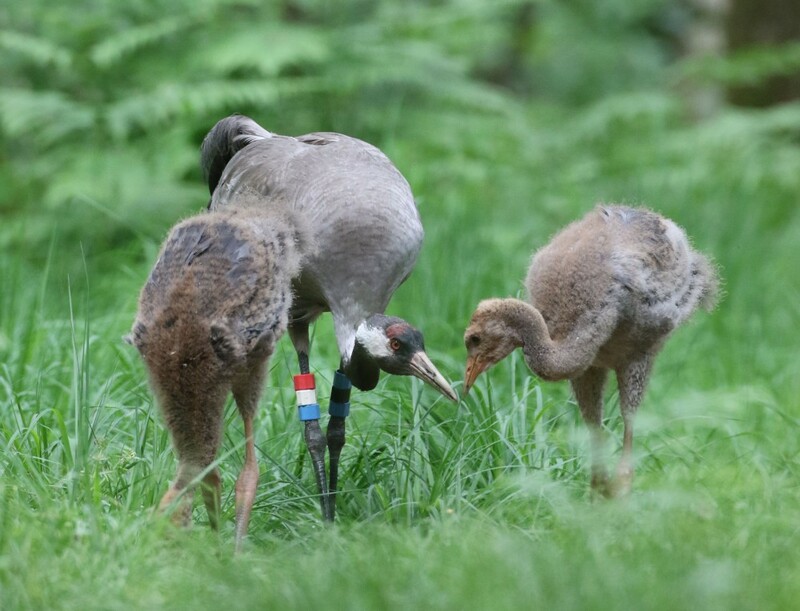 iCORA is an online database for recoveries of colour-ringed and radio tagged Eurasian Cranes (Grus grus) in Europe. The iCORA website offers the possibility to report observations of individually marked cranes or to report bearings of radio transmitters. 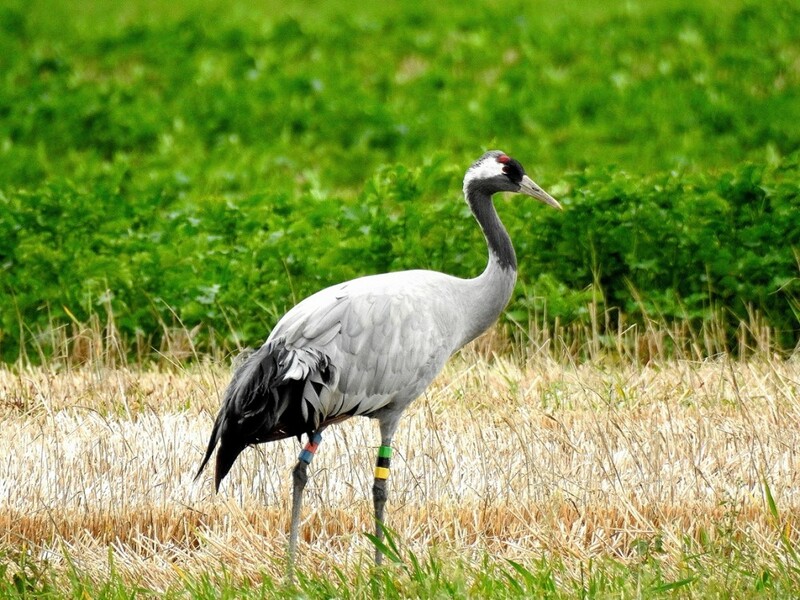 After that, the life histories of the reported cranes can be obtained. 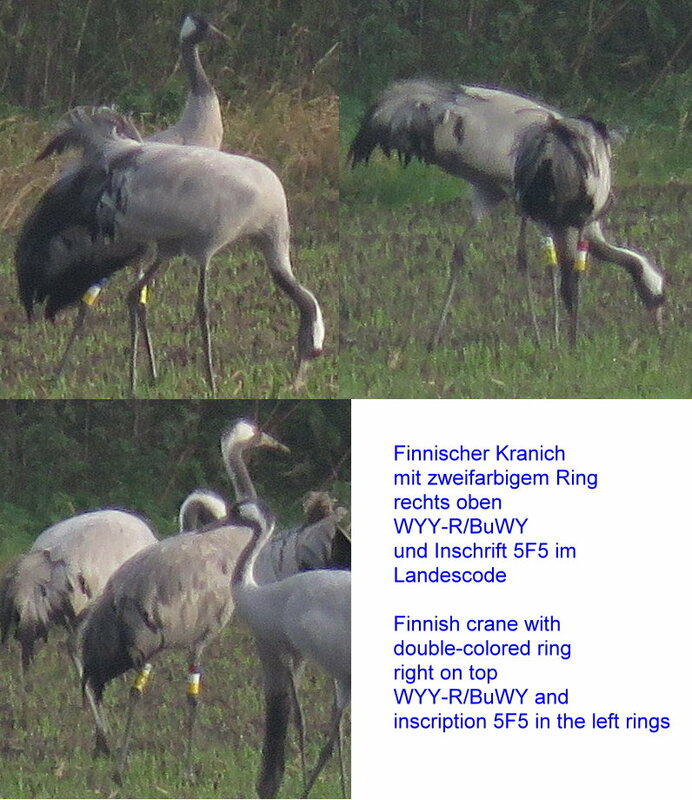 You can find more detailed information about ringed cranes here. 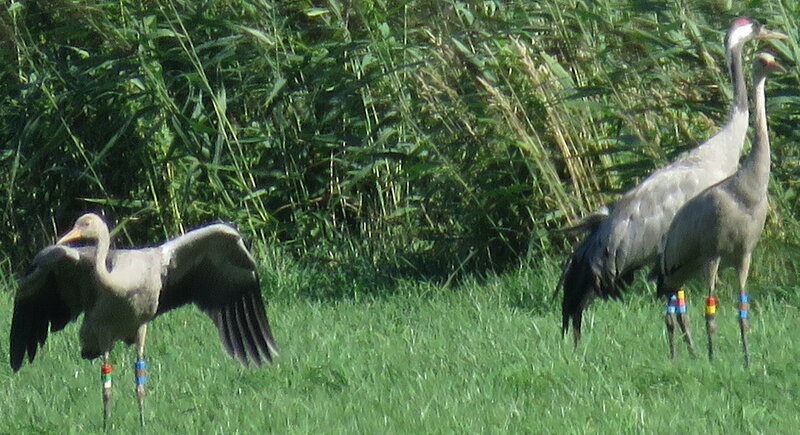 Results about crane migration can be found at http://www.kraniche.de/Biologie/Zug.shtml. For questions and notes please use our contact form. The realization of iCORA was generously supported since 2008 for three times through grants given by the North German foundation for Environment and Development (NUE), using revenues from the Bingo lottery. 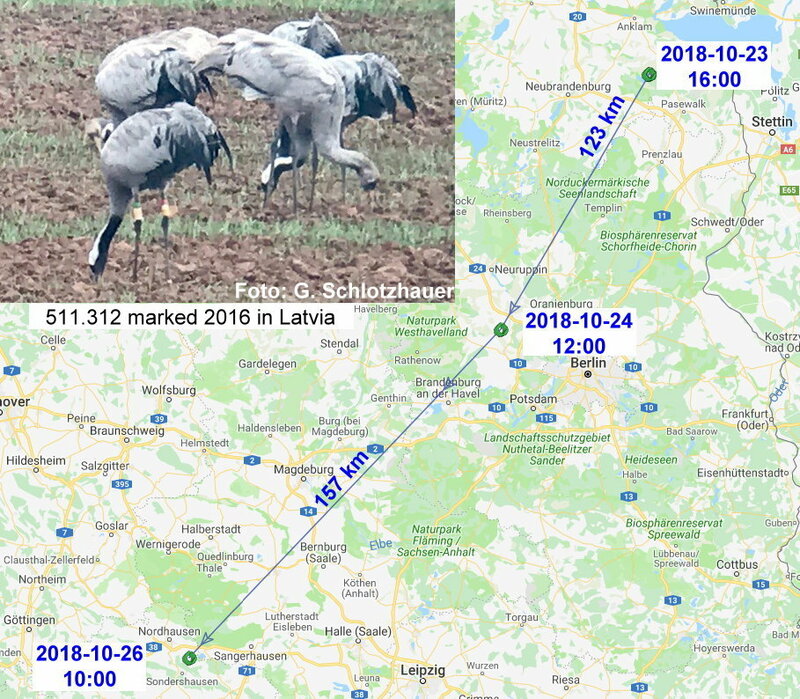 The Latvian crane 511.312, ringed as juvenile in 2016, provided a striking example for the migration route from lake Galenbeck (east of Neubrandenburg), where this year 36,000 cranes were resting, via Rhin-/Havelluch (Linum) to the Kelbra reservoir (Helmestausee) on the border of Saxony-Anhalt and Thuringia. From here it will probably migrate non-stop via Hesse to France. Last winter it was even seen in the Extremadura (Spain). Eventually it will pass the winter there again. 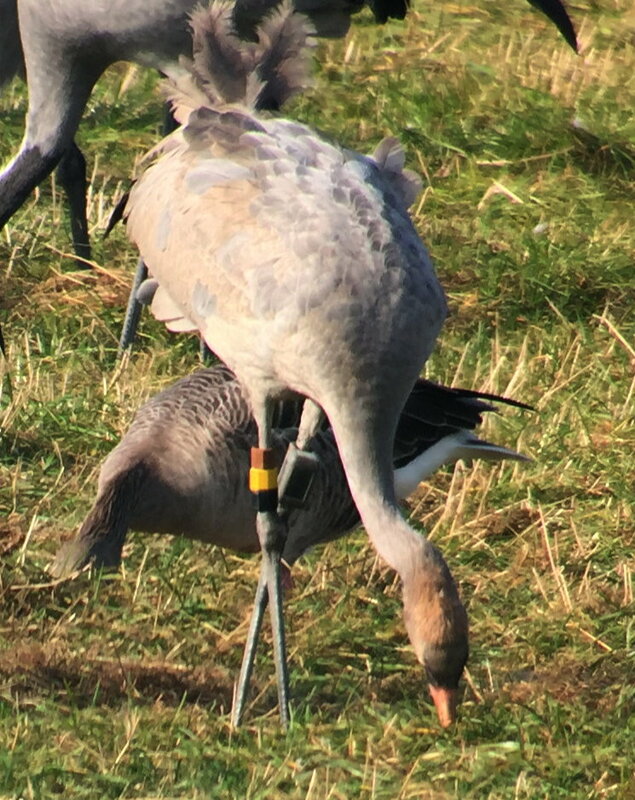 In Estonia ringed cranes are coded this year with 611(black/white/white). Ringing data are already in iCORA, so that the reports are automatically assigned to the correct crane. On Thursday 27th of September 2018 a bunch of threatening emails was sent. If a given amount of Bitcoins is not transferred to an account, the blackmailer/s threatened to send compromising, private material or internet use to all contacts. The blackmailer/s also claimed that the computer is remote-controlled, equipped with a key logger and suchlike. Email address and (former) password were included. These data were probably stolen during an attack some time ago. Change your password from time to time and do not use one and the same password for several accounts. In particular passwords for email-accounts, bank-accounts and similar should not be used on websites not starting with https. iCORA is now with https! Blue - Blue - Brown. 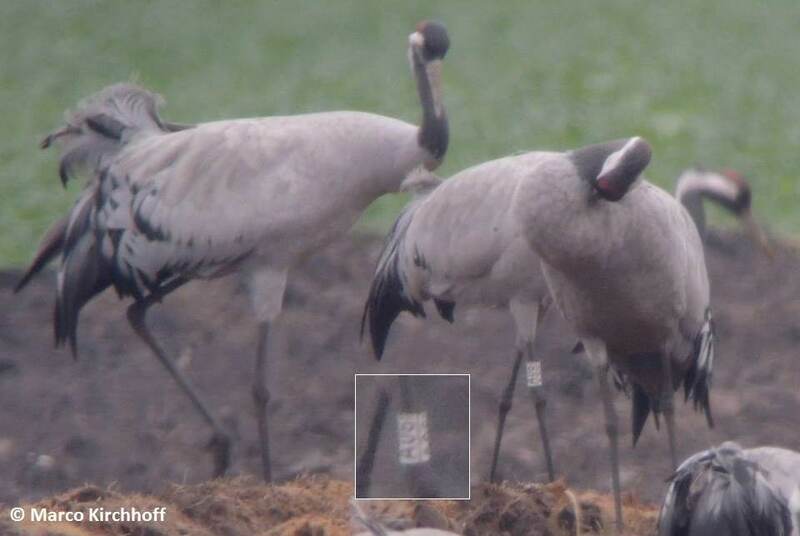 In 2018 in Germany was marked in total 187 cranes with colourrings. 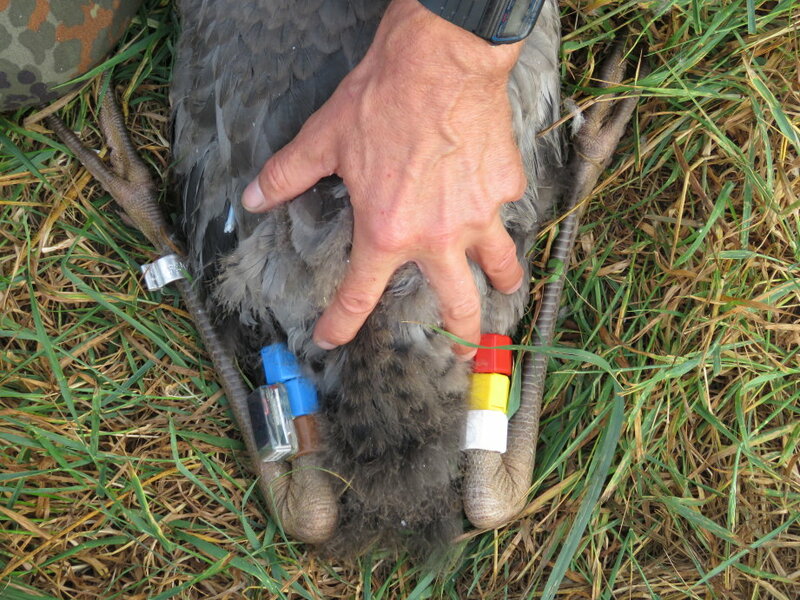 Some of them also have a GPS leg-transmitter from Max-Planck-Institute of Ornithology. With the new version of the iCORA website, many changes and new features were incorporated. Therefore, a complete revision of the help function (help & FAQ) was necessary. Now a completely new help function with extensive explanantions of the iCORA website is online. Since more than 25 years, cranes are marked with color combinations in Europe. 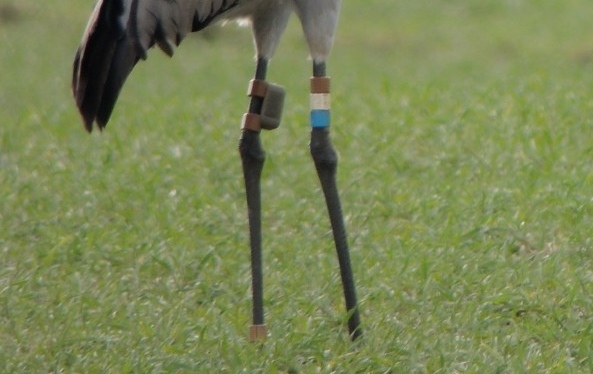 Due to a convention of the European Crane Banding Group, the left leg will marked with 3 color rings of the country code, while another 3 rings on the right leg will be an individual code. The country code can consist of 2 or 3 rings of the same color about each other, while the individual code never has 2 rings of the same color upon each other. If you watch a color combination on the right leg with possibly 2 rings of the same colors upon each other from far distance, you have to watch very carefully again. Under poor light conditions, some colors look very similar, especially the colors blue and green are sometimes difficult to separate. With the new version of iCORA, also the input of color legrings with code was implemented. 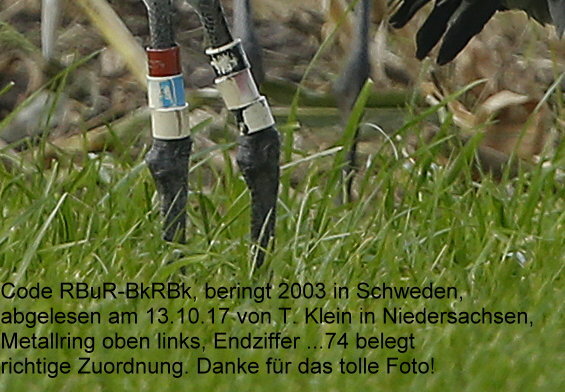 Only a few cranes with blue or red legrings with white inscriptions ringed in former times in Germany, Sweden and Finland are still alive. 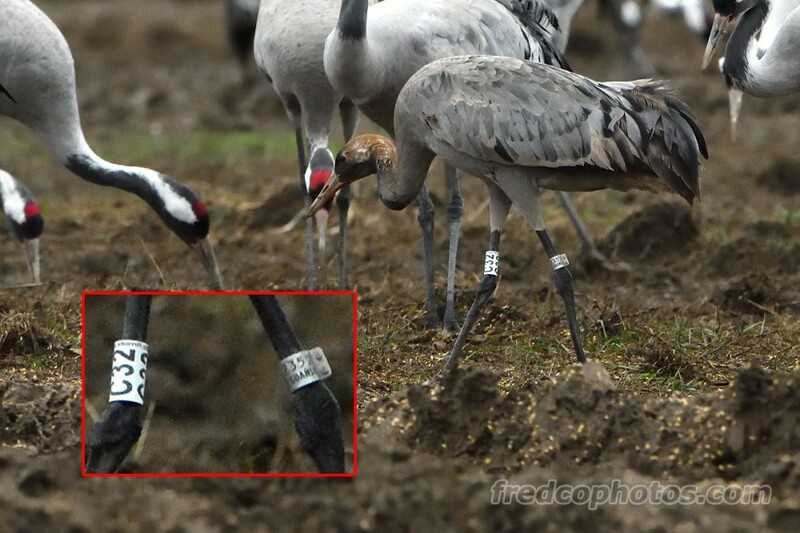 Since several years cranes with white legrings and black inscription are marked in Poland. Those legrings are always attached above the foot link, while the code has one letter followed by two numbers. Such birds with coded legring can also be reported via the iCORA website. While insert colorring information, you have to choose the coding type "Alphanumeric code". 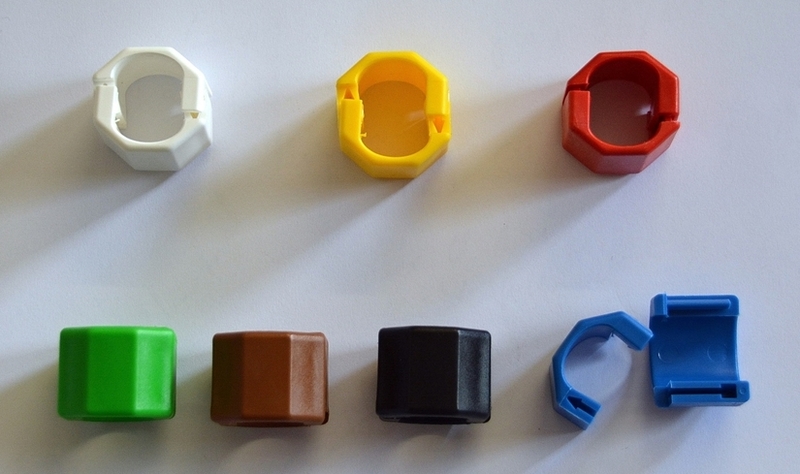 In the next step you then have to insert the color and the code of the legring separately. To better follow up the status of your observation reports, all your observations under “My reports” are now marked with different colors. New observation reports will be in blue color in the beginning, until the project administrators look at these reports and change their status. If a report was validated as correct, the observation will be shown in green color. If there are some doubts about the observation (e.g. the bird wasn’t seen in the region before), the observation will be labeled with “under reservation” and is shown in orange color. With this procedure we make sure, that no observations went lost, if they later on occur to be correct. All observations, which cannot be assigned to a specific crane, are marked with red color. 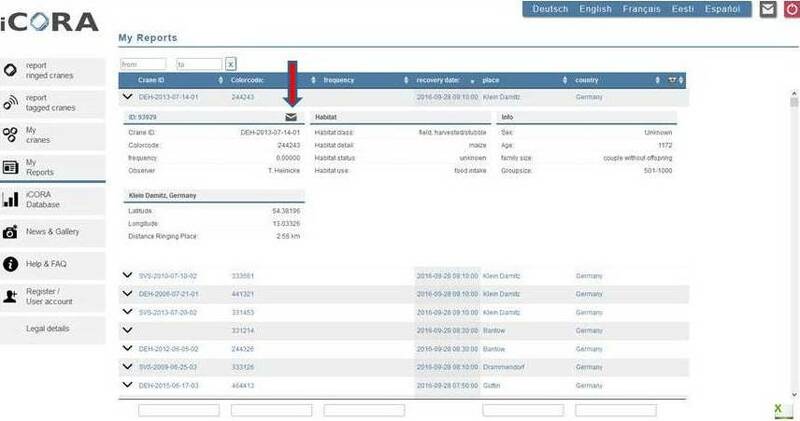 Only clear misreadings or wrong reports will be deleted from the database. 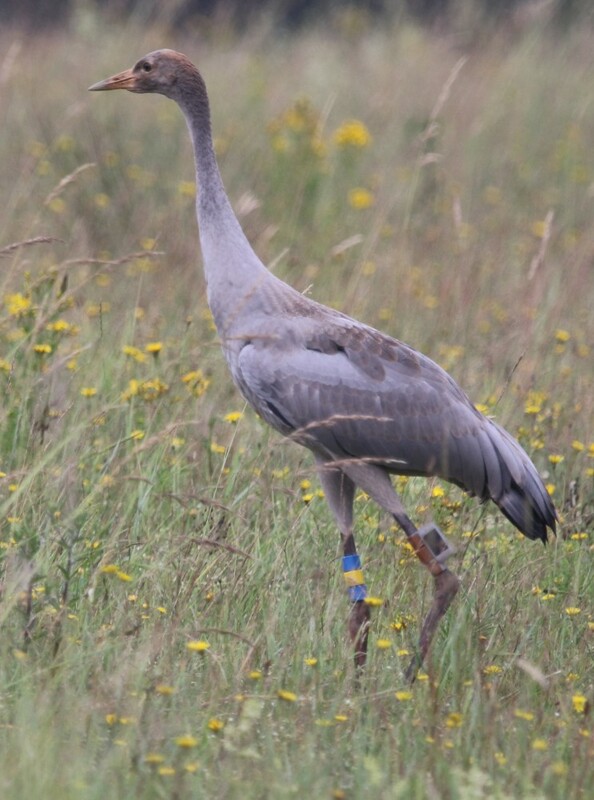 Observations of cranes, for which ringing data are absent in the iCORA database or if ringers/projects do not participate in the iCORA project, are assigned as external data and marked with purple color. These data will be directly forwarded by us to the relevant projects and ringing centres. 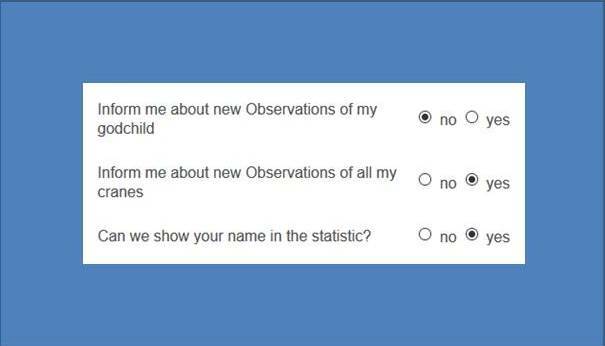 If you want to make remarks or annotations to one of your observations, you can do it by using the contact form. You have to open the full report by clicking on the arrow symbol. In the next step you click on the letter symbol next to the ID of the observation. This ID will be automatically added to the contact form, so that admins can easily go to the right observation. Finally one request from our side: please do not flood the project admins with many requests, as we expect more than 10,000 new reports during the year 2016. 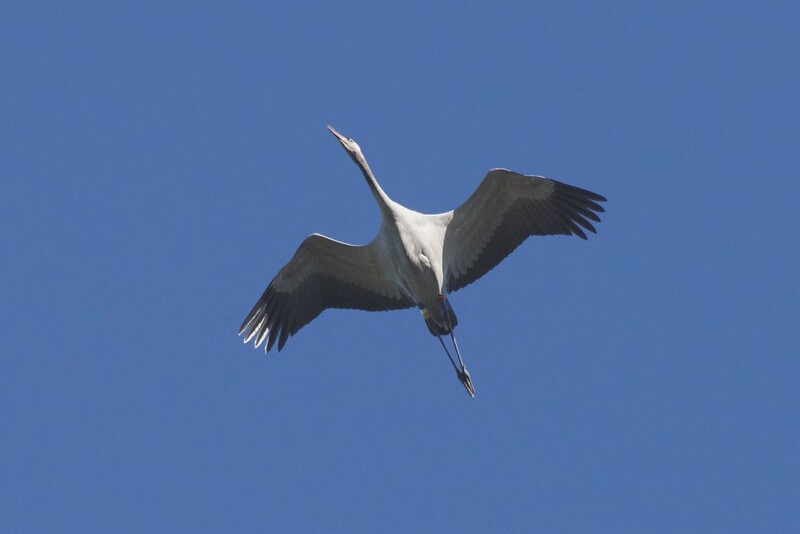 What a remarkable crane picture! All seven different ring colors are visible at one picture. Many thanks to Till Gütte for this great picture. Keep up the good work! 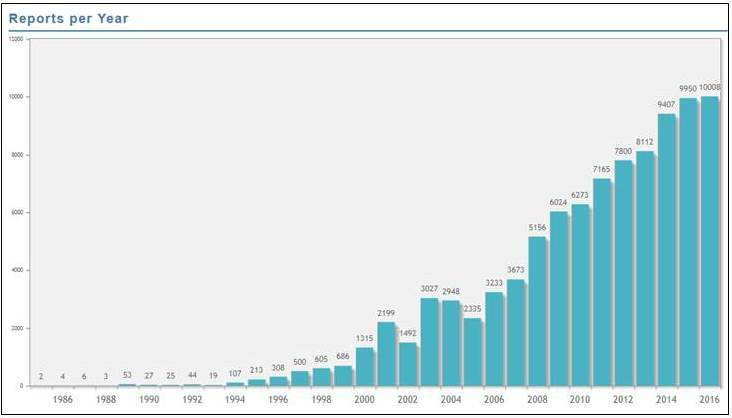 Today the magic limit of 10,000 observation reports per year in the iCORA database has been reached!!! 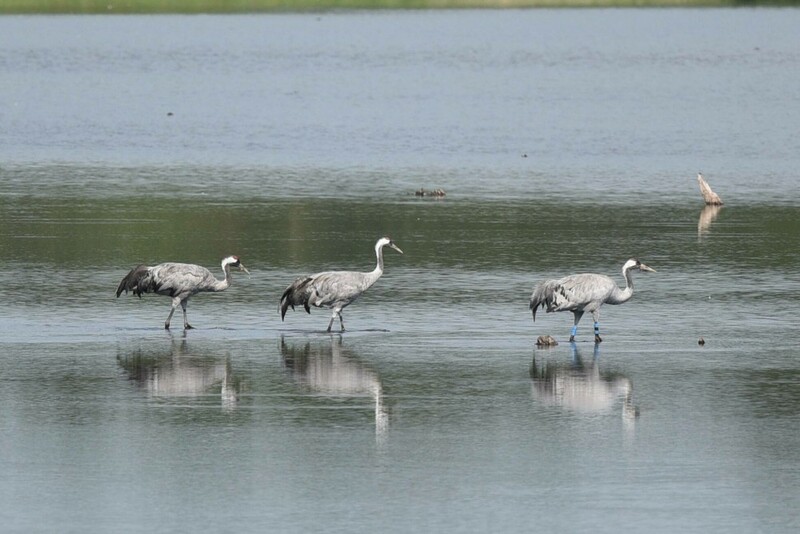 Due to technical problems, faulty infomails about new sightings of "My cranes" were sent out during the last days. We apologise for that. We therefore decided to revise this infomail, so people which activated that function (see menu user account) will now receive a regular collective message with new sightings approximately once a week. 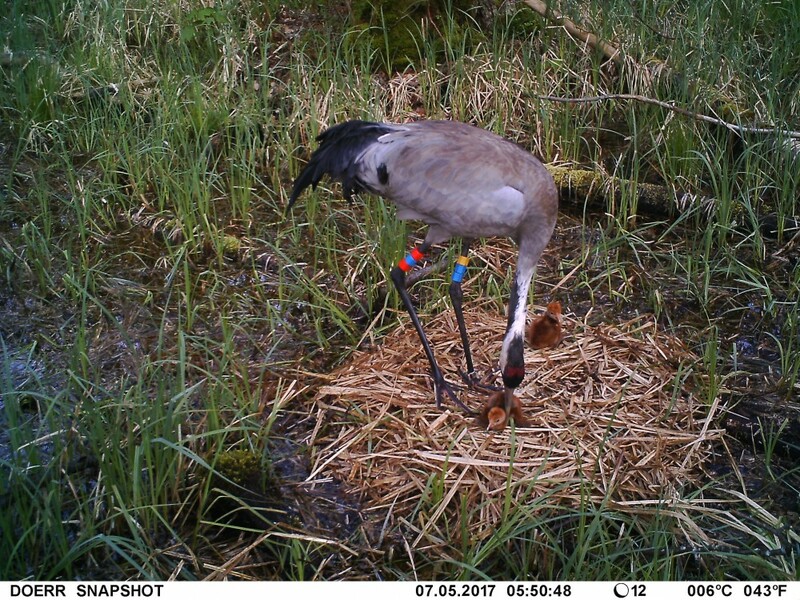 The messages about new sightings of godchild cranes has not been changed. 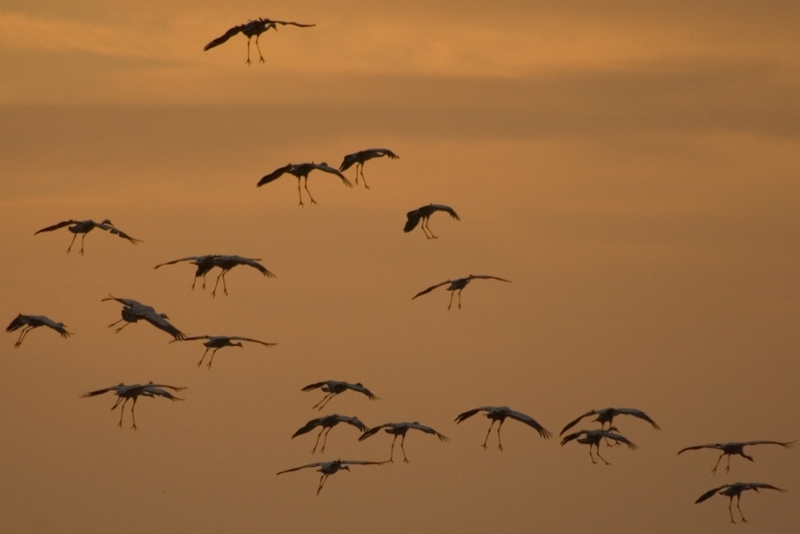 As before, these messages are send out after every single new observation of these cranes. The input of birds with radio transmitter has been further improved. If you push the button "+" behind the input window or push the tabulator-key, the inserted frequency and the remarks are saved in a special table. 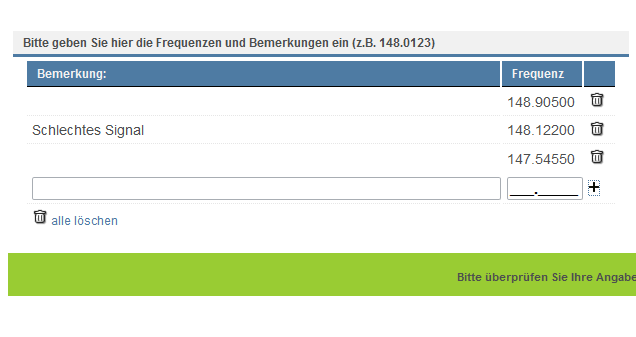 Data from that table can easily be removed by using the recycle-button behind the entry. All entries can be deleted by pushing the recycle button below the input window. We now managed to implement also a map function with OpenStreetMaps (OSM), which is available under "My cranes" and within the map function of "report ringed cranes". We would like to thank Ulrich Niemann for his idea and proposal. OSM contain many more details than other maps, especially more local site names than google. With the new version of iCORA, we also managed to optimize our website for users, which use smartphones or tablets instead of a PC or laptop to report crane observations. The new design now allows optimizing iCORA to your different screens. 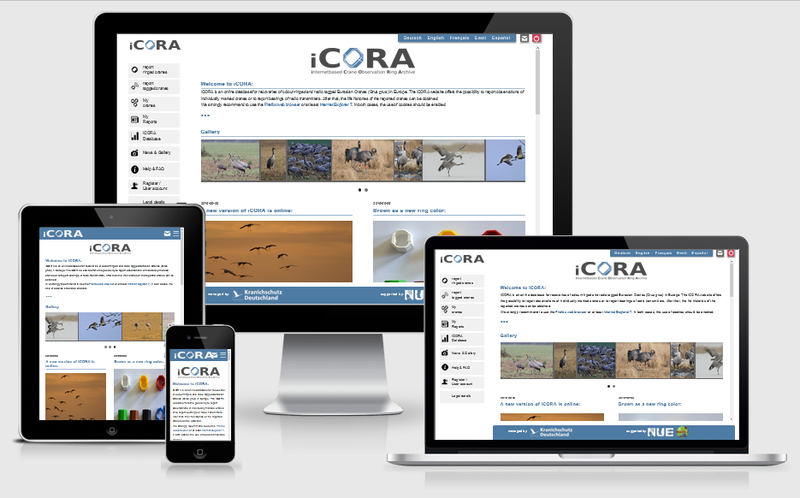 Since Friday, 9th of September, a new version of the iCORA database is online. The database & website not only occur in a new layout, but also bring a lot of new functions and improvements for the users. The new version for instance allows a more easy input of observation sites, exact input of co-observers, more detailed information on flocksize, more easy information about site and habitat use as well as allows data input of readings of alphanumeric colorings and also metal rings. Additionally, also the life history reports are much improved. The pdf-versions now show a map with all recovery sites, but also information about co-observers, flocksize and relationships between birds. More details about all improvements can be found under FAQ. The new update of iCORA was again kindly supported by a grant given by the North German foundation for Environment and Development (http://www.nue-stiftung.de/), using revenues from the Bingo lottery.